The Cougars have qualified for the NJSIAA Group IV finals for the second time in four years. Sophomore Sarah Pierce won the South Jersey Group IV sectional meet at Delsea High School last weekend. The Cherry Hill East girls cross country team is heading to the NJSIAA Group IV finals for the second time in four years after finishing fourth at the South Jersey Group IV sectional at Delsea High School in Franklinville. Cherry Hill East was led by a pair of first-year runners. Sophomore Sarah Pierce won the South Jersey sectional and freshman Grace Yoon finished fifth in the most competitive sectional of the day. To advance to the state finals, a team must finish in the top five at sectionals. Eighteen teams and 125 runners competed in the Group IV sectional that was won for the second year in a row by Kingsway. Olympic Conference rival Shawnee qualified for the sixth consecutive year and was second, also for the second year in a row. Finishing just ahead of Cherry Hill East was Toms River North, which is heading back to the state finals after missing it last year for the first time in 12 years. The final qualifier was fifth place Clearview. Cherry Hill East’s team score of 119 is the third-best in school history only behind the teams from 2005 (87) and 2006 (58), which were both South Jersey champions. Their average time of 19:38 is the second best behind only the 2006 team (19:12) which went on to finish second in the state finals and seventh in the Meet of Champions. Pierce is the first female Cherry Hill East runner to be the South Jersey champion. Pierce’s time of 18:05 set a new school record beating the 18:11 set by Theresa Cattuna in 2006. Pierce beat Kingsway senior Rachel Vick, who finished fourth last year, by 10 seconds. Pierce’s time was the third fastest of the day in South Jersey behind only junior Alyssa Aldridge (17:41) of Mainland Regional and senior Briana Gess (18:04) of Haddonfield, who is also the three-time state champion in the 1600m. Pierce’s time was also the fastest time for all Group IV runners in the state. Yoon’s time of 18:47 is the fifth best ever by a Cherry Hill East runner and is the best ever by a freshman in sectionals beating Melissa Shower’s 2005 time by over a minute. 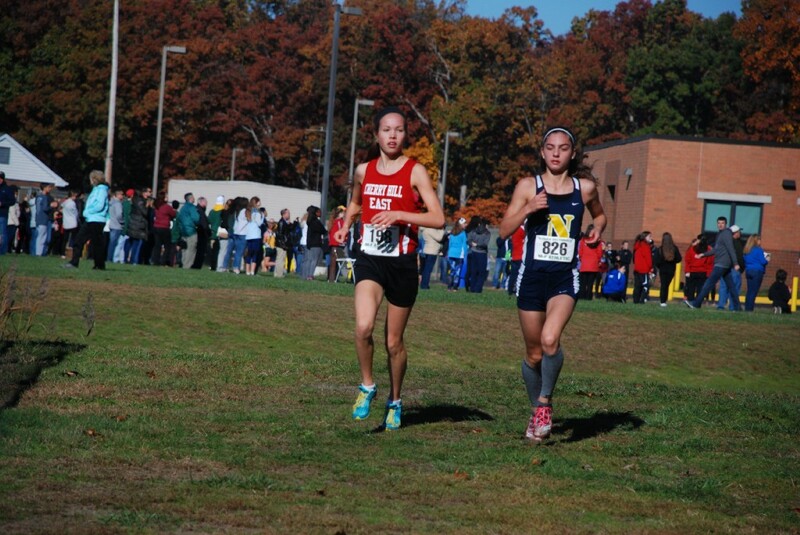 Sophomore Dani Lazarus (27th, 20:01) improved her time from last year by 46 seconds and has the fifth best time ever by an Cherry Hill East sophomore in sectionals. Junior Greer Field (42nd, 20:39) had her best time of the year. Also pointing for Cherry Hill East was senior Alexa Happ (44th, 20:42) who broke 21:00 for the first time at Delsea and improved her time from 2015 by 1:02. Finishing sixth for the Cougars was senior Taegan Field (52nd, 21:12). Taegan Field is the only senior on the team to run varsity in the sectional all four years. Also running varsity for East was Junior Jill Westman (65th, 21:23). Westman’s time was the best final time for a Cherry Hill East runner since Brittany Scarpato in 2007, which shows how strong the East team is this year. Next up is the State Group IV Finals at iconic Holmdel Park. The state finals feature the top five teams from the four sectionals. Should East finish in the top three, it will advance to the Meet Of Champions for only the second time in school history.